The West Brook Trail has been a favorite of hikers and equestrians for many years. It goes down the beautiful Town Creek valley among towering redwoods and crosses Town Creek near the bottom on a bridge that was constructed many years ago. The old bridge is 20 feet long and built with abutments at the edges of the creek. Over the years, the creek has eroded the western abutment, requiring the bridge and trail to be closed. The team from ETRAC: Mike Bushue and Walter Gloskowski, designed a new bridge that would be 30 feet long, which will allow the new abutments to be set back 5 feet from the creek edges. It would not be necessary to do any work in the creek. The beams would be new Alaskan Yellow Cedar glue lams, which will be stronger than the existing bridge. It would also be 1 foot wider, to permit County staff to drive small equipment over the bridge in the case of an emergency or fire. The new bridge will be in the same location as the existing bridge, which will be removed. We got environmental approval and permits mid-December. The goal is to have the new bridge done by June 1, 2019, so we can have a great summer riding in Jack Brook. Construction will begin shortly after April 15, if the weather cooperates. The order for the beams, which have a two month lead time, has been placed. The budget estimate is $25,000 total: $15,000 for materials, $10,000 for labor. 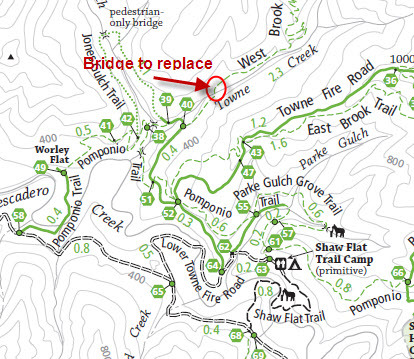 Any excess contributions will be used for other trail repairs. The Mounted Patrol Foundation is a 501(c)(3) charitable entity, so donations are tax-deductible to the amount permitted by law. As of April, we have over 90% of the funds necessary. Make a notation on your check Towne Creek Bridge.